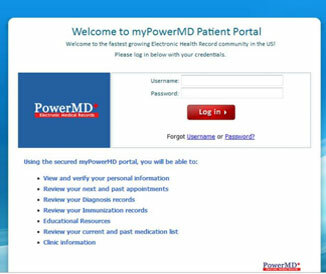 PowerMD’s sleek patient portal displays an easy-to-manage user experience! The patient’s records are organized by appointments, health records, medication lists, resource information, clinic, and the home page. The compiling of this useful patient data allows the patient to access their records wherever they want, from wherever they want. The home page gives informational view content on that patient’s electronic medical records. When the patient enters the appointment section, they are easily able to view a table of pending and completed visits along with the date and time of that scheduled visit. Any additional notes related to that visit are also viewable by the patient. A patient’s health records are viewable as either a diagnosis or immunizations. The diagnosis records show the patient’s diagnosis (recorded according to the ICD-9 diagnostic coding system), as well as the start and stop date based on the status of that particular diagnosis. The patient’s diagnosis records can also easily be printed, if need be for whichever purpose. Immunization records display a viewable chart listed with the patient’s entire immunization history. The immunization table format shows important information such as which immunization was administered, during which date, even if there were any comments. Once again, the patient’s immunization records can easily be printed, if need be for whichever purpose. Medication lists are easy to view as the patient’s current medication lists, and the patient’s past medication lists. Whether the patient wants to view or print the current or past medication list, a diagnosis and the doctor who prescribed the medication are clearly listed. In addition, information like dates, quantity, and the recommended frequency of the medication are also quite easy and clear to view. The resources page gave us a way to provide patients a great way to discover just who PowerMD is. We also give patients some government resources they should investigate more, so that they can learn more about the services they are able to qualify for. It’s a great way to learn more about nutrition and health! Finally, the patient has access to their affiliated clinic information. Any reference that needs to be made to the clinic the patient associates themselves to, can be done so by the click of a mouse. The pertinent information relating to the clinics name, address, and even the practitioners included at the clinic are able to be viewed thru the patient portal!